1933. Albemarle County, Virginia. 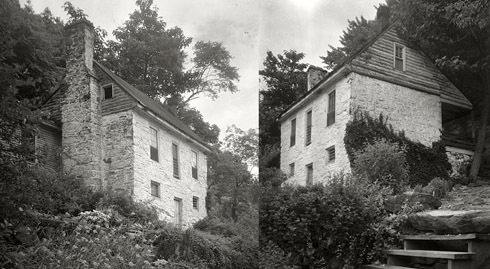 "Johnston's Mill house." 8x10 inch safety negative by Frances Benjamin Johnston. View full size. Submitted by Anonymous Tipster on Sat, 06/19/2010 - 5:59pm. Submitted by Miguel Chavez on Sat, 06/19/2010 - 1:19pm. Am I the only one who was reminded of the usual outcome of my childhood adventures with that chair placed strategically in a quiet corner of the house? Submitted by mechmike on Sat, 06/19/2010 - 10:32am. Johnston's Mill, on the National Register of Historic Places, is also known as Cocke's Mill and Coles' Mill. Built ca. 1820. Submitted by Rogue Architect on Sat, 06/19/2010 - 9:04am. Thank God for Frances Benjamin Johnston - I could study this photograph for hours. 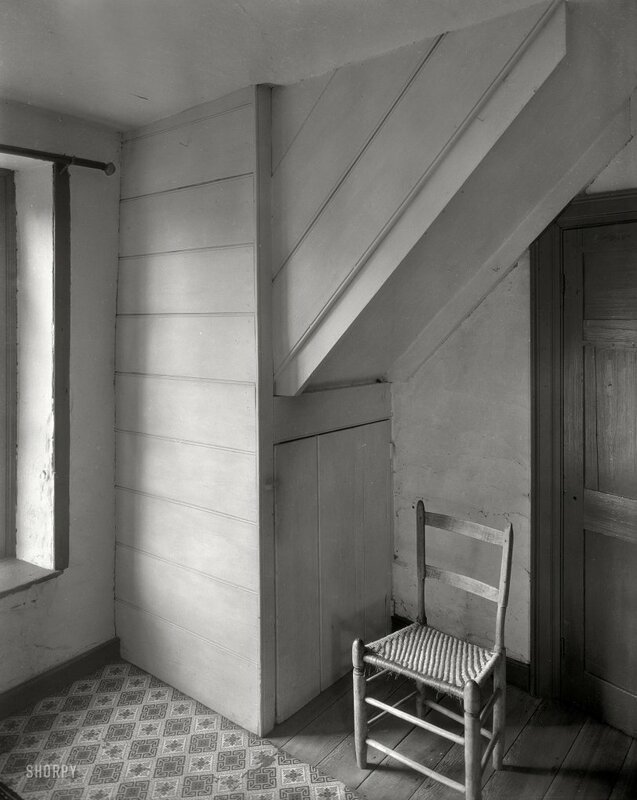 I'm intrigued by the busily-patterned linoleum which falls short of covering the floor (is it a runner?). It is interesting that the boxed-in stairwell clad in beaded board is painted to match the walls while other woodwork is painted in a contrasting enamel. What is in the closet beneath the landing? Handprints around the catch tell us the door has been opened with at least some frequency. The paneled door has been re-hung; a telltale hole remains from a rim lock which was positioned on what is now the hinged side of the door. The grainy texture of the door does not match that of the moulded casing surrounding it. Where was this door originally? I want to know! Submitted by Bob in new orleans on Sat, 06/19/2010 - 6:00am. Beaded-board used for walls yet it's 10 inches wide. The width of the floorboards too give one an idea what sort of lumber builders had on hand. We can only read about what timber was to be had when the house was built. Submitted by Anonymous Tipster on Sat, 06/19/2010 - 1:58am. A truly minimalist composition that nevertheless has a lot of charm to it and is well worth seeing. Submitted by Rip Tragle on Fri, 06/18/2010 - 11:39pm. Submitted by woodchuck on Sat, 06/19/2010 - 9:17pm. After three hours of trying to complete a complex computer task, I put it all on hold with a headache and clicked my Favorites list for Shorpy. While I find our present day technology a rewarding challenge, how wonderful it must have been to have this simple private place with just a good book. I wonder what is conveniently stashed inside the cupboard door to make it an even more relaxing place. Submitted by EmmaH on Fri, 06/18/2010 - 11:06pm. All those interesting lines, and then your eye comes to rest on that little chair. Submitted by Anonymous Tipster on Fri, 06/18/2010 - 10:53pm. It's easy to envision this as painted by Edward Hopper. Submitted by Bull City Boy on Fri, 06/18/2010 - 10:02pm. This is just a terrific photograph. At first the arrangement and geometry grab you, but then the little details: the nail in the wall, the curtain rod, the worn linoleum, etc. just knock you out. WTG, Frances.